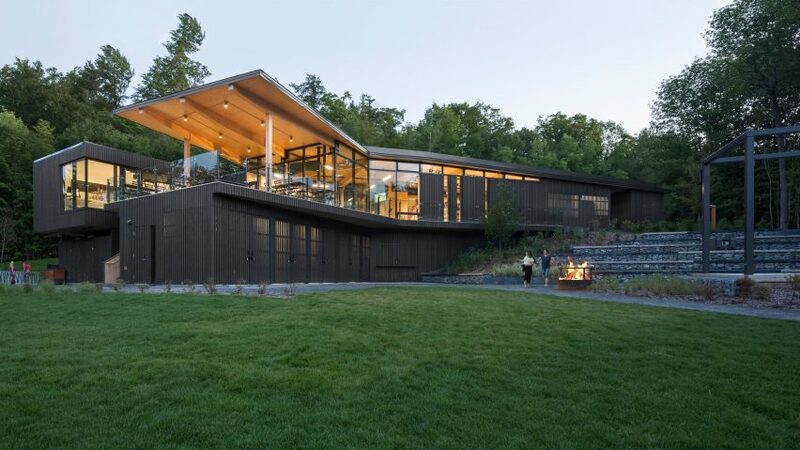 Quebec architecture firm Anne Carrier Architecture has completed a visitors centre in the Mont Orford National Park, built using a wooden structure that nestles into the landscape. 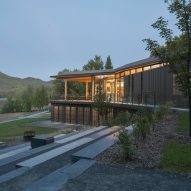 The Bonnallie amenities centre is part of a larger commission the firm earned to design three new public pavilions for the national park. "These projects will give Mount Orford a distinct signature, expressing a clear architectural language," said the architects. Completed in June, the project encompasses 430 square metres of public programmes. These include boat maintenance facilities, a welcome area for visitors, and an outdoor terrace overlooking Stukely Lake. Visitors access the pavilion from the south, where a central opening in the black-stained cladding reveals views of the lake beyond. This leads to an open space that can be used for events or seasonal activities. The terrace is accessible through this space, and contains outdoor seating that is sheltered by an overhanging roof. This floor also contains amenities such as a kitchen and gift shop. An exterior staircase leads downstairs, where there is storage for boats. 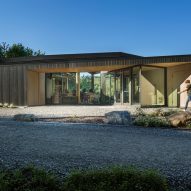 "Exterior and interior spaces are connected by a network of walkways, stairs, covered passages nooks that are inspired by the natural meandering of walking trails," said the architects. The building's angled geometry opens towards an external amphitheatre. Set into the site's topography, the performance space is used in warm weather for concerts. 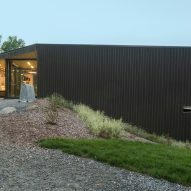 The two-storey project is clad in blackened wood, which contrasts a lighter finish on the inside. "Similarly to a sliced fruit, pale cedar cladding differentiates the skin from the interior," said the architects. "This allows a coherent reading of the building,"
Wood is also used for the building's structure. For shorter spans, the architects used solid timber elements. Others were long enough to require the use of glue-laminated timber, a composite made of smaller layers bound together with an adhesive. 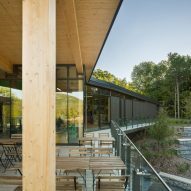 Other small institutional projects completed in the province of Quebec include a hydroelectric plant clad with timber slats and a memorial that stands on site of a fish processing plant that was destroyed in a fire. Photography is by Stephane Groleau.